Home > Communications, Technology, Media > Other Communications M - Z > Soundview Technology Group, Inc. 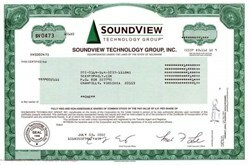 Beautifully engraved certificate from the Soundview Technology Group, Inc. This historic document was printed by the American Banknote Company and has an ornate border around it with a vignette of the company logo. This item has the printed signatures of the Company’s Chief Executive Officer ( Mark Loehr ) and Chief Financial Officer. SoundView Technology Group is an investment banking firm focused exclusively on technology. From the manufacturer of the smallest component to the provider of enterprise-wide systems, they are deeply engaged with the thought leaders driving technological development and the key investors who facilitate growth within the sector. They are supported by a research team with unique credentials: the majority of our analysts have specific, relevant industry experience or have engineering or scientific degrees. Their informed perspective and the quality of their analysis has distinguished us among our peers and earned us the recognition of corporate clients as well as top institutional investors who rely on our research for daily investment insight. Soundview has the world famous analyst, Timothy O'Neil.